First off – you don’t need to go out and buy a spiralizer to make these. If you’re going to invest in a gadget, I highly recommend the julienne peeler because it’s inexpensive, works great, and is small enough to fit in your utensil drawer. But if you really want curly noodles (and you have an extra shelf to spare), spring for the spiralizer. I have both for no good reason at all. This recipe is pretty simple – zucchini, tomatoes, and olive oil. I made a lemony sort-of-ricotta out of sunflower seeds and macadamia nuts. 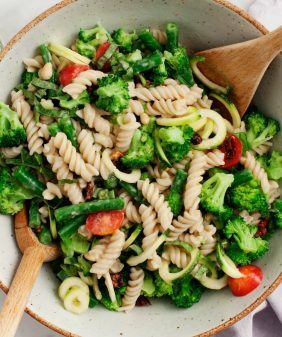 It’s delicious to serve on the side and scoop onto the noodles as you like. If you have extra, store it in the fridge over night and slather it on toast the next morning. 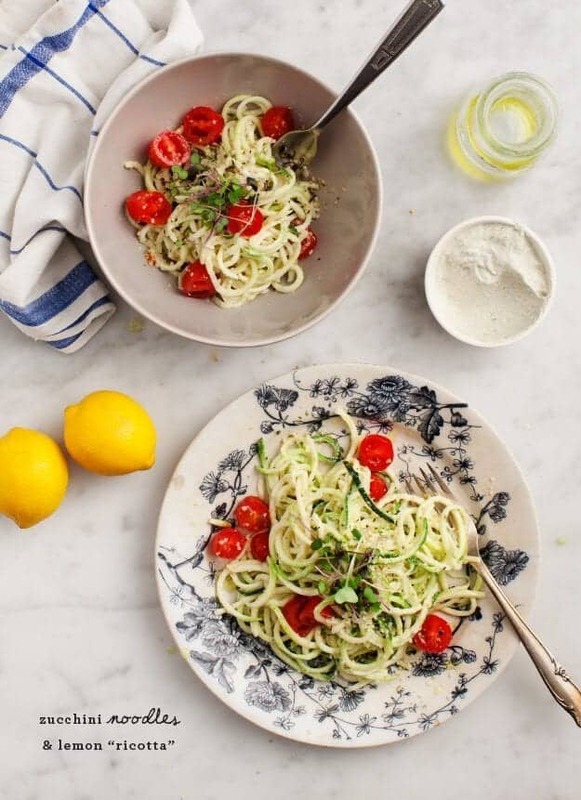 zucchini noodles & lemon "ricotta"
Drain and rinse your macadamia nuts and sunflower seeds that have been soaking. Add them to a high speed blender with hemp seeds, lemon juice, lemon zest, white wine vinegar, garlic, herbs, salt and pepper, and water. Add a little olive oil, if necessary, to get your blade moving. 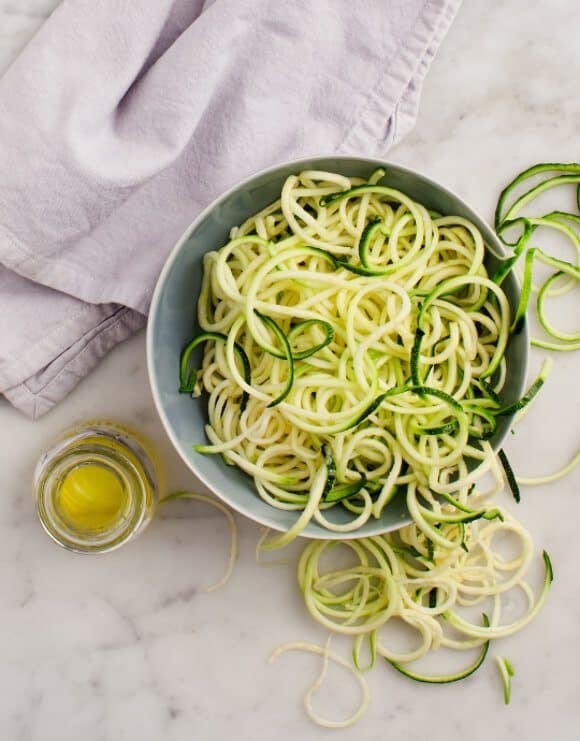 Toss zucchini "noodles," with a few spoonfuls of the ricotta, the tomatoes, a drizzle of olive oil and a few pinches of salt and pepper. Serve with extra ricotta on the side. Extra ricotta will keep in the fridge for about 1 day. If it gets a little watery on day 2, give it a stir until it's cohesive again. option 1: replace macadamia nuts, sunflower seeds, and hemp seeds with all sunflower seeds. option 2: replace macadamia nuts, sunflower seeds, and hemp seeds with an equal amount of raw cashews. Do you think you could use macademia nut butter and sunflower seed butter instead of soaked nuts for this? Oh wow-that “ricotta” recipe looks so good!! I must get ingredients and try it, especially now that I have lotsa zucchini to use from our CSA!! I am on a ricotta kick lately. so that sounds just perfect to me. 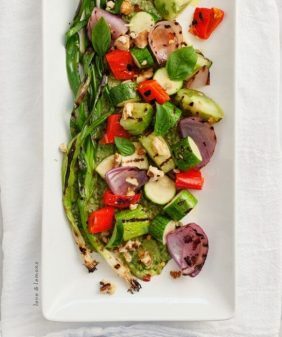 What a fresh summer recipe! Looking forward to trying the macadamia nut ricotta – I never have those in the pantry, but I guess I should start! Half of traveling is eating and half is getting from one place to eat to another. Enjoy! I’ve made your sunflower cheese before so I can only imagine how good this ricotta is, especially with the macadamia nuts and hemp seeds. 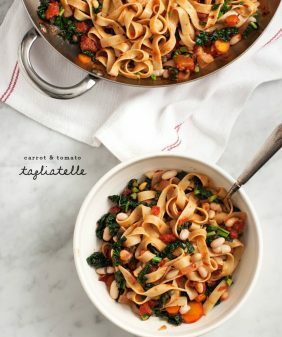 Really need to make this noodle bowl this summer! Wow, this looks & sounds delicious! I’ve never tasted zucchini “noodles” but I am looking forward to trying them soon. Thanks for sharing! 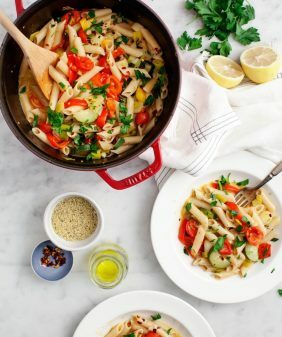 This recipe looks so light and fresh! 🙂 And have fun in Italy, be safe! Kid you not, I just ordered a “noodler” and it’s scheduled to arrive tomorrow! Pretty excited and can’t wait to use it. I’ll definitely giving your recipe a try! I love succhini, I love “ricotta”, I’will mary a lemon… so I will taste this recipe soon! I have a spirilizer, which I purchased and have used several times. Still testing the waters. You could try – I actually prefer it raw because when it’s cut into such thin strips it gets limp and mushy quickly when cooked. The raw “noodles” have a nice al dente bite. Thanks Jeanine. I wouldn’t mind them being raw. But my husband might. Just thought a real quick sautee. I would put the tomatoes in first with the garlic and then add the zucchini with the herbs. If I do it, I will let you know how it turns out. I like to put my zoodles in a bowl with a couple tbls of water and nuke them for two minutes. Comes out “cooked” just enough for us. I wondered the same thing – about maybe just blanching the zucchini. Then I thought that perhaps any warmed up or hot topping put to it would be enough given how thin the strips are. Can’t wait to try it. SUCH a good idea. The “ricotta” looks creamy and delicious, a perfect balance for the zucchini noodles. I’m thinking lunch tomorrow! Great recipe! I can’t wait to try it! 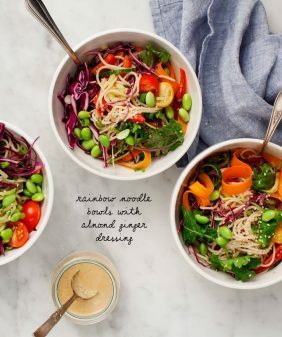 I have heard about using courgette/zucchini as noodles and never given it a try – this recipe has inpsired me! Looks so fresh! 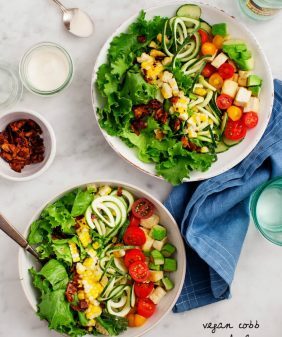 Nice to see a ricotta dressing on the zucchini noodles instead of the typical tomato sauce – going to give this a go!